Let Us Quickly Transform Your Dreams Into Reality! Thomas Beck LTD. specializes in residential design and installation for all elements of new construction in the valley of the sun for the past 20 years serving homeowners, home builders, architects, and interior designers alike. We are a licensed, bonded, and insured company that is whole and solvent providing support for all aspects of our customer's projects in an efficient, personable, and professional manner. 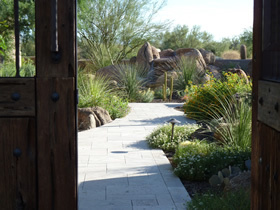 Values on our completed projects have ranged from 10K - 500K and many have been featured in Phoenix Home & Garden magazine including "Showcase Home of the Year", "Street of Dreams Homes", and the "Extreme & Elite Homes of the Year". Design services are offered on an hourly basis and construction services on either a cost plus or guaranteed fixed price basis. Because your satisfaction is very important to us, you can expect the same professional support on both small and large projects. Our designs and construction are meant to stand the test of time and we are especially proud that the relationships we have established with our customers have as well! Let us help transform your dreams and desires into a reality. "I want to thank you for everything you have done for us. I spend a lot of time in the front yard now to relax and get away from all the stress. 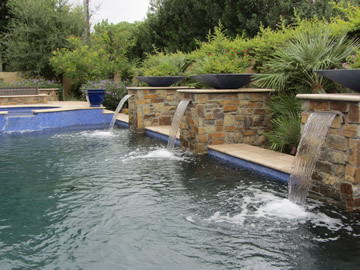 The workmanship is without parallel, compared to the other typical landscape companies out there. I've cared for many other lawns in the past and you can truly see the difference! I may not own the biggest yard, but I have the best yard on my block. Thanks for listening to us. You guys really take care of your customers. I recommend the services of Thomas Beck for any landscape needs. They can truly make your dreams come true!" With over 25 years experience serving Scottsdale, Paradise Valley, Arcadia and Phoenix, Thomas Beck LTD will work with you and address all of your exterior construction needs!